Here's why these stocks could keep soaring. We're in a bull market, so finding stocks that have doubled isn't hard. But strong past performance doesn't guarantee strong future performance. Only some of those doubled stocks will continue to provide investors with market-beating returns. Three candidates are Match Group (NASDAQ:MTCH), Berkshire Hathaway (NYSE:BRK.B), and Codexis (NASDAQ:CDXS), according to three of our Motley Fool contributors. Here's what you need to know about these promising stocks. Travis Hoium (Match Group): One of the hottest stocks on the market over the past year has been Tinder owner Match Group, which is up 147% in that time. The company has had sharp rises in users and subscribers as online dating continues to gain steam. The second quarter was indicative of the company's improvements across the board. Paid subscribers were up 27% to 7.72 million, and revenue per subscriber rose 8% to $0.57 per day. Tinder was the big winner in the portfolio, adding 1.7 million paid subscribers to reach 3.8 million in the quarter. What's changed in the past year is that people are now willing to open their wallets to use apps like Match and Tinder. These apps can start as free to use, but ultimately, Match Group wants to convert users to paid members. That conversion strategy is working today, so the company can slowly raise prices on users. What's great about Match Group's business is that it gets stronger as more users come onto the platform. Tinder, in particular, has become the go-to dating app on smartphones, and it should hold that title for the foreseeable future, because it would be difficult for other services to gain enough critical mass to compete. That's a great position for a business to be in. And with shares trading at just 33.8 times forward earnings estimates, this is a growth stock that could have room to run higher. Tim Green (Berkshire Hathaway): Shares of Berkshire Hathaway, Warren Buffett's $500 billion conglomerate, have more than doubled since the beginning of 2013. The stock has outperformed the S&P 500 during that time frame, and it could continue to outperform the broader market in the years ahead. 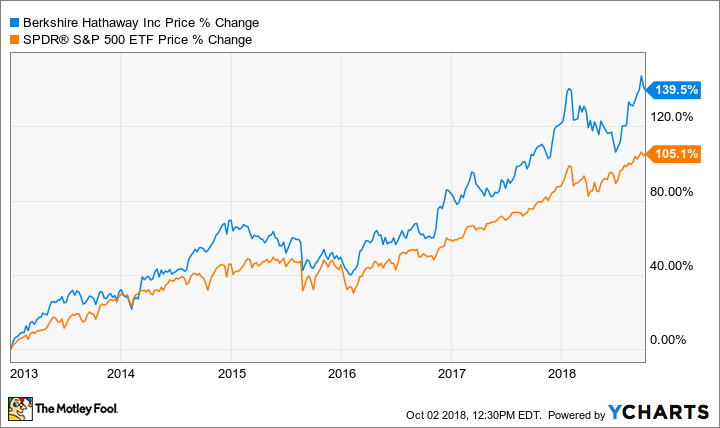 Berkshire doesn't look all that cheap based on its earnings, but one indication that it may be undervalued is Buffett's recent decision to buy back some shares. For many years Buffett tied share buybacks to Berkshire's price-to-book-value ratio, using that metric as a proxy for the intrinsic value of the business. Anytime the stock fell below 1.2 times its book value, Buffett was authorized to buy back shares. Buffett is now free to buy back shares of Berkshire if he and vice-chairman Charlie Munger agree that the company is undervalued, a much looser policy. Berkshire bought back some of its shares earlier this year, a sign that Buffett sees Berkshire as a good value even though it's doubled since 2013. With Berkshire already one of the biggest companies in the world, the stock doubling again in the next five years would be quite a feat. But with the broader market trading at historically high multiples of earnings, Berkshire could certainly provide market-beating returns. Maxx Chatsko (Codexis): Shares of Codexis have gained over 220% in the last year, to hand the company a market valuation of $1 billion. That admittedly makes the stock a bit expensive at the moment, especially for an unprofitable operation that expects to generate only around $61.5 million in revenue in all of 2018. But the market is betting that protein engineering has a major role to play in the future of biotechnology, for both industrial and healthcare applications. And since Codexis is the only publicly traded company with a robust protein-engineering platform, the big-picture excitement is easy to understand. The finer details support that, too. Codexis owns a technology platform that allows researchers to design, build, and test novel proteins and enzymes for a variety of applications. Historically, the primary market has been supplying enzymes that speed up and lower the cost of manufacturing processes for pharmaceutical ingredients. But the business is rapidly expanding in non-pharma applications. That includes supplying enzymes for use in next-generation sequencing (NGS) workflows for genetics research, and the just-started ramp-up of a major food ingredient from industry leader Tate & Lyle (NASDAQOTH:TATYY). The latter should result in the largest-ever supply of Codexis enzymes beginning in 2019. And, not to be overlooked, the company also licenses its machine-learning platform to major companies interested in giving protein engineering a go in-house. Taken together, the recent diversification of the supply business will significantly de-risk the company's recent foray into the clinic. That's right: in addition to supplying enzymes to various industries, Codexis decided to engineer a protein that could act as a therapeutic drug, to treat the metabolic disorder phenylketonuria. It's off to a fast start. Nestle Health Science has joined as a partner, and will handle development and commercialization activities after phase 1 studies -- expected to announce top-line data by the end of 2018 -- are complete. Given all the long-term potential, Codexis should grow into its $1 billion valuation over time -- and perhaps earn an even higher one, if all goes according to plan.